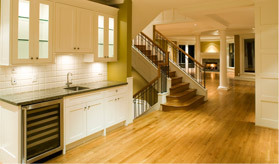 Russell Hardwood Floors has delivered exceptional quality and customer care for nearly 30 years. Contact UsWe’d love to speak with you. The finished hardwood floors are beautifully done, new areas of hardwood segue seamlessly with the existing hardwood that was refinished. Communication was excellent. Our input was sought at appropriate times and Russell staff offered expert advice. The cost of the job was more than reasonable. 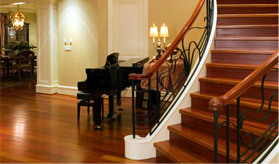 From custom inlay, border, and stair installations, to refinishing your existing hardwood floors, Russell Hardwood Floors has the expertise to fulfill all your wood flooring needs. Two generations and 30 years of experience in the business allow Russell Hardwood Floors to provide the best service and product available. Customer satisfaction is our #1 priority. 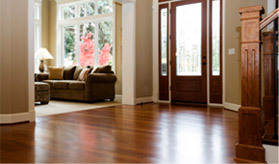 Covering the entire spectrum of the wood flooring trade, Russell Hardwood Floors provides start to finish service on new construction, remodels, and refinishing projects.